The Collier House was built in 1886 by Dr. George Haskell Collier, a University of Oregon physics professor, as his family home. The two-story wood frame building is a prime example of the Italianate style and was designated a Eugene City Historic Landmark in 1976. At construction, the site of the house bordered the University of Oregon’s campus boundary to the south, on what was then open farmland. As a result of the expansion of the University throughout the 20th century, the Collier House is now at the heart of a bustling college campus and has been adapted for academic use. Its position at the center of the academic core has raised the question many times over the last several decades about whether a more intensive academic use would be more appropriate there, especially given the high development pressure for these uses. The question arose once more, with the initiation of planning for the Classroom and Faculty Office Building project. 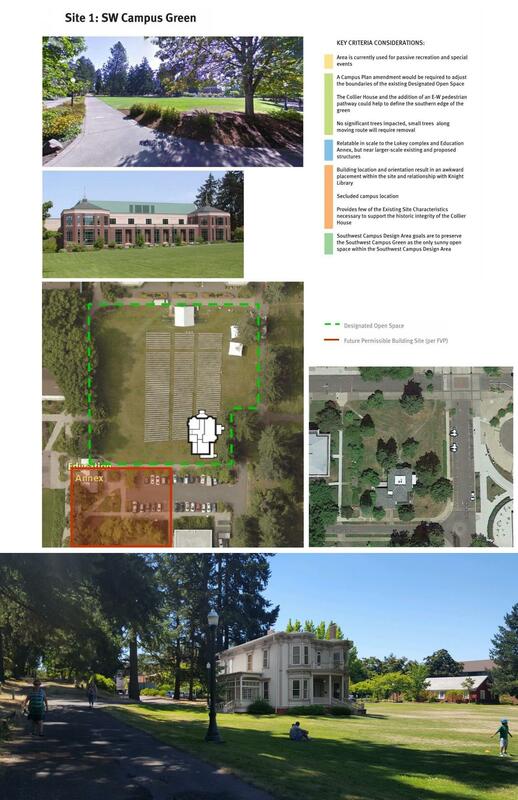 After an extensive process of consultation and collaboration (see the Process section below), the Campus Planning Committee (CPC) took action on November 27 and recommended the Gerlinger Field Green as the preferred relocation site for the Collier House. Final approval of the relocation site resides with President Michael Schill, who will now consider the recommendation. The relocation of the Collier House is an opportunity to restore the exterior massing of the house to what it was during its period of significance. Therefore, the 1960s additions to the house would not be moved along with the rest of the home and the original positions of doors and windows in those locations would be restored. The criteria used to assess each of the sites for the Collier House relocation fell into five major categories. These criteria were primarily drawn from principles in the Campus Plan (the document which guides development on campus). For more details on the site selection criteria, please see the August 7, 2018 CPC presentation. This study was initiated in the early stages of the Classroom and Faculty Office Building Project – when the Collier House site made it through the first round of site evaluations. Given the primary historic significance of the Collier House, the University of Oregon wanted to ensure that it was physically possible to relocate the house while maintaining its structural integrity. Over the 132 year history of the Collier House there have been a number of alterations and additions, some of which were not in keeping with the original character of the home. The most impactful of these changes were made in the 1960s and altered the exterior massing of the building. A potential relocation of the house presents an opportunity to remove these additions and restore the exterior massing of the Collier House to what it was during its period of significance. See the floorplan below for more information on the parts of the house that would move during a relocation. For the purposes of this initial study, three general locations within the campus boundary were considered as possible relocation sites: one within the campus core, one a little further out, and the last on the peripheries of campus. This was done to test the logistics of potential move routes and understand more about possible constraints that could exist. This study determined that it is physically feasible to move the Collier House with minimal impacts (e.g. hairline cracks in the plaster). It is relatively easy to move the house within the boundaries of campus, especially within the center and west parts of campus. 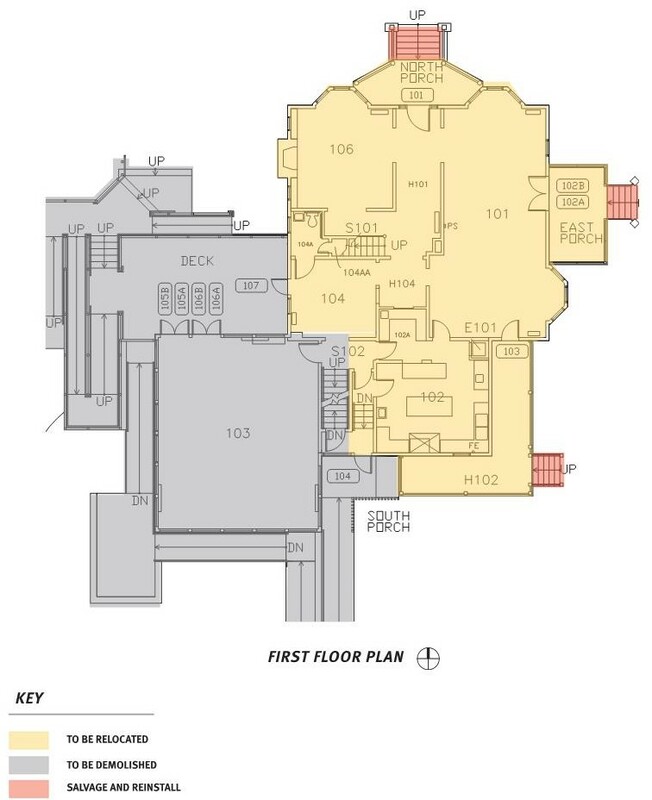 Moving the house east of University Street is feasible, but would require cutting the house in half. This should be avoided if possible as it would require additional preparation work before moving and more complex repair work after moving. 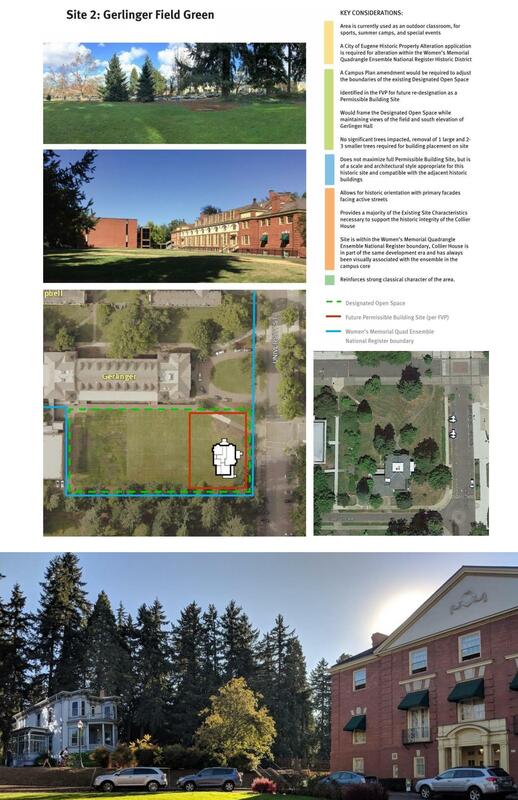 When the Collier House site was identified in June 2018 as one of the top five sites being considered for the Classroom and Faculty Office Building, it was necessary to begin a site selection process for the Collier House to understand whether a good relocation site existed on campus. The outcome of that study would help to determine if the Collier House site was truly a viable site for the Classroom and Faculty Office Building. The site selection study for the Collier House relocation began by considering a wide range of possible sites. The only criteria used to identify the full list of potential sites were whether the house could fit on the site and make good use of the available land resources. Working with the Campus Planning Committee (CPC), all fifteen available sites were analyzed at a high level to identify any features that would make them unsuitable for the relocation of the Collier House. The initial round of analysis narrowed the original fifteen sites to four. At their meeting on August 7, 2018 the Campus Planning Committee confirmed that eleven of these sites were appropriate to remove from further consideration. See the full meeting record for the August 7, 2018 CPC meeting for more details. The remaining four sites were analyzed in greater detail. 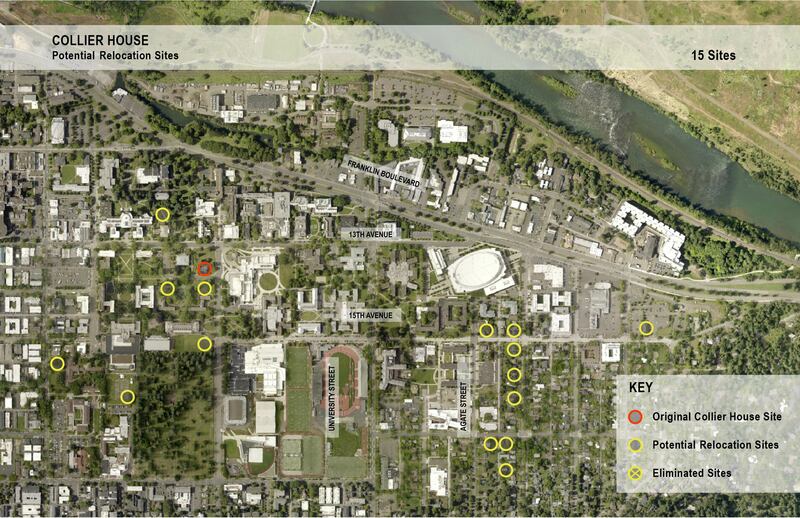 These sites were the Gerlinger Field Green, the Southwest Campus Green, a site at the terminus of 16th Avenue on Alder Street, and a site at the western edge of the Women’s Memorial Quadrangle. At the Campus Planning Committee meeting on October 19, 2018, the Hennebery Eddy – the project consultant (and experts in the field of historic preservation) presented their assessment to date of the four primary relocation sites. The committee agreed that it was appropriate to remove the site at the western edge of the Women’s Memorial Quad from further consideration. See the full meeting record for the October 19, 2018 CPC meeting for more details. 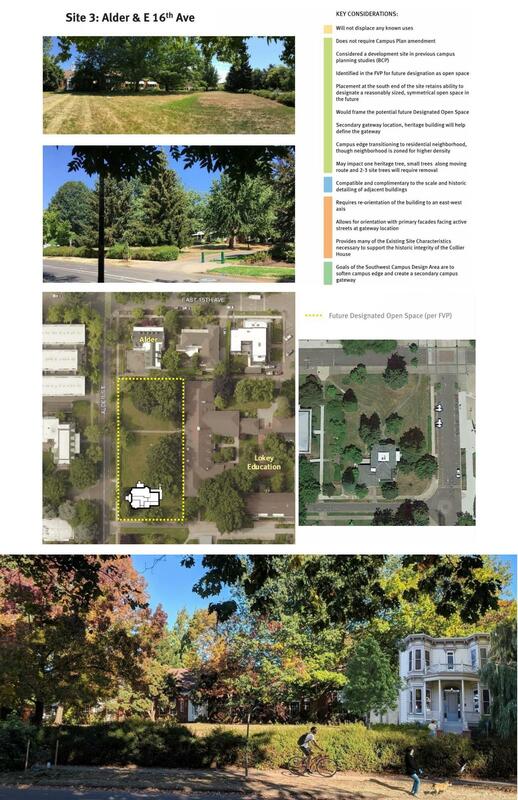 At the CPC meeting on November 27, the consultants presented their in-depth analysis of the three primary sites: the Gerlinger Field Green, the Southwest Campus Green, and the site at the terminus of 16th Avenue on Alder Street. The careful and thorough analysis done by the consultants on the basis of the criteria taken from the Campus Plan led them to recommend that the best site for the relocation of the Collier House is Gerlinger Field Green. After reviewing the presentation by the consultants, the committee took action and made a recommendation to the President that Gerlinger Field Green be selected as the preferred relocation site for the Collier House. See the full meeting record for the November 27, 2018 CPC meeting for more details. A Campus Plan amendment will be needed to adjust the designated open space boundaries on Gerlinger Field Green. This will follow the standard Campus Plan amendment process as laid out in Principle 1 of the Campus Plan. The University of Oregon will work with the City of Eugene to fulfill the required city processes for the relocation of the Collier House, and will consult with the State Historic Preservation Office (SHPO) and advise them of the proposed changes.